In her study Does active learning work? Stanislava shares her experiences with using active teaching methods while teaching psychology. I am really impressed how frankly and deeply Stanislava reflects on the unexpected results of supporting active learning. And I feel happy that despite the results of her study Stanislava did not reject the concepts of active and student centred learning. It seems that Stanislava had very high expectations to observe visible change in student learning after a 90 minute workshop. As she suggests herself, using teacher centered and student centered approaches in one session may have confused students. My experience is that students moreover need preparation for a new teaching-learning situation and some time to get used to new activities. I believe teacher should also explain clearly, what is the purpose of using that specific teaching method. Stanislava shares her observation that students did not take notes during active learning activities. I have noticed the same – students in groups discuss actively, exchange ideas, viewpoints and come up with solutions , however they do not write anything down. Maybe they will realize later how valuable these discussions are for their learning. Or maybe they just can’t do several things at once (think-talk-write). What works well in my classes is giving special time to students for writing summaries after their discussions. We often expect that our pedagogical innovations make huge positive change immediately, however this does not always happen. Learning traditions shaped by teaching traditions do not change so rapidly. I will suggest reading Stanislava’s chapter to my colleagues who are preparing staff members for innovating their teaching. I will recommend them paying attention to how Stanislava invited also other colleague teachers to collaborate in the study and how carefully she has planned the process of innovation and assessing its outcomes. 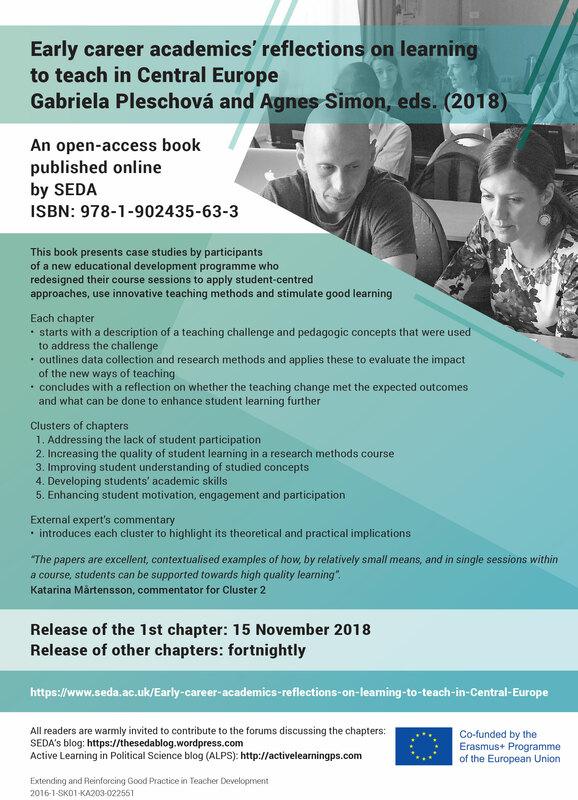 This entry was posted in Blog, Early Career Academics' Reflection on Learning to Teach in Central Europe, Early Career Academics' Reflections, SEDA and tagged Early Career Academics' Reflections, Educational Development by SEDA. Bookmark the permalink.